The scientific name for an Arctic Fox is Alopex lagopus and either name is correct when identifying this Arctic animal. This Arctic Fox scours the shores of the Hudson Bay in Churchill, Manitoba looking for any type of food that it can find to feed on. 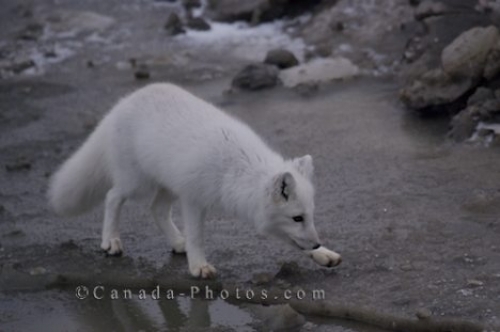 Focusing on something up ahead, the Arctic Fox slyly makes his way across the icy surface. Picture of an Alopex lagopus or better known as an Arctic Fox along the shores of the Hudson Bay in Churchill, Manitoba.